I need to run after time so that I can finish the zillion of things before bébé arrives. And surely this new life stage is coming faster than we can imagine. I am sure that it might well be the case for you too, even if there isn’t any bébé in the making and planning — but I know that there is for some of you who kindly left notes in this space before! Then, there is Thanksgiving arriving so fast! You agree, don’t you? This year, my friend R. asked that I were in charge of preparing dessert and the appetizer for the dinner he is hosting. I am excited: R. is a great cook and loves to entertain. Yesterday, we tested my dessert idea and I must say, we all really liked it. Perhaps not a traditional Thanksgiving dessert. Not at all in fact but then, I think I will be forgiven as the dessert has chocolate in it, and it feels tout tout léger (very light). Si, si, believe me! I will show you and you can tell me what you think. But after this chocolate coma though, I thought that it could be nice to go for a change and enjoy something fruity. You know that P. loves rice pudding, don’t you? The whole Irish family does. Preferably eaten warm, as P.’s mum likes to add. So I started a rice pudding recipe. It used lemon zest and lemon extract. But in the end, I turned the dessert into fruit sushi: a simple, fresh, and pleasing way to finish our meal. We ate it lukewarm, because we prefer it this way. “What are you doing?” my mother-in-law asked when I called her at noon to wish her a happy birthday. “Oh, so tempting! she exclaimed enthusiastically. I knew that she was going to like the idea. This kind of dessert is always a winner in their family. In a pot, heat the milk* with the lemon zest and extract. When it reached boiling point, pour the rice in it and reduce the heat. Simmer, stirring once in a while, for about 20 minutes, or until most of the liquid is absorbed. Add the sugar to taste and mix. Let cool, stirring occasionally. With the palms of your hands (run them under water to make the task easier), shape small sushi. I prefer to eat them lukewarm, so if necessary, reheat them gently. Place a slice of fruit on each, apple or grapefruit, or mango if it is the season. Sprinkle with grated coconut and add a leaf of mint. Serve with raspberry sauce. Light and fresh, for anyone loving rice pudding. *You can also substitute milk with coconut milk, if you like. Rinsez le riz sous de l’eau froide. Faites chauffer le lait* dans une casserole avec le zeste de citron et l’extrait de citron. Ajoutez le sucre, mélangez et goûtez, puis laissez refroidir, en remuant de temps à autre. Faconnez de petits sushis avec la paume de vos mains (passez-les sous de l’eau entre chaque sushi pour faciliter la tâche). A ce stade, je préfère que les sushis soient encore tièdes (au besoin les réchauffer doucement) — à vous de choisir. Couvrez chaque sushi avec une tranche de fruit, pomme ou pamplemousse, ou mangue quand c’est la saison. You continue to amaze me. These look amazing. A great idea! Delicious too! Your pictures are so gorgeous! This is so clever and wonderful 🙂 I am a huge fan of mediterranean cooking while my brother (whom I live with) is all about sushi. Maybe I can get him to dine with me on some fruit sushi. What a fabulous idea! Beautiful, healthy, and original. Thank you! Those are absolutely beautiful…and fun….and original! Lucky guests. Rice pudding: good! 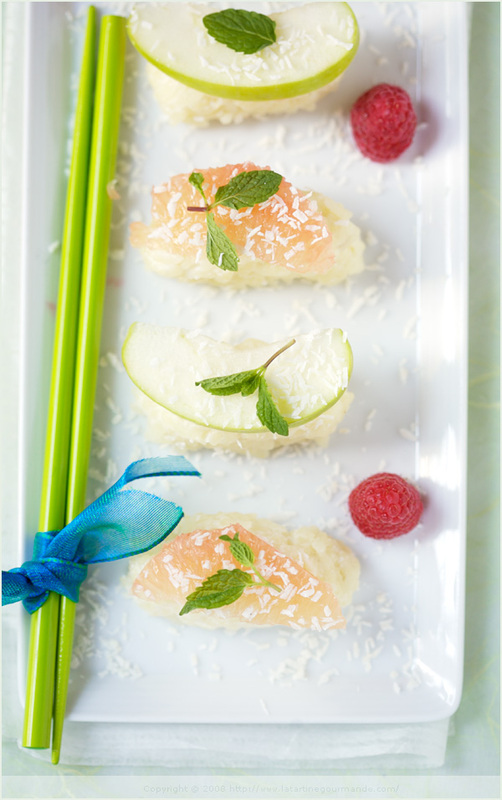 Rice pudding fruit sushi: even better!! this is so creative, Bea!! Such a wonderful and creative concept Bea! Lovely! looks fantastic. light and colorful and anything with rice pudding is a winner in my book! oh how I adore this idea!! Yeah!! I love Sushi de fruits!! Made them once and absolutely love them! The sweetness of the rice and the fruits are just amazing! j’ai eu l’idée de faire des sushis sans poisson (parce que j’aime pas) il y a quelques mois, mais je l’ai jamais fait – oh la paresse – donc, je suis ravie que t’as eu presque la même idée sauf en sucrée. ca a l’air vraiment bon et je vais sûrement faire ce dessert pour des amis bientôt! merci béa! Quelle bonne idée et quelle magnifique réalisation! Tes sushis de fruit me donnent l’eau à la bouche. J’adore tout ce qui est riz au lait & Cie! J’essayerai avec du lait de coco aussi! Juste une question: pourquoi laves-tu le riz pour risotto? J’avais lu que cela faisait partir l’amidon et que alors il collait moins…ce n’est pas le cas chez toi? Oh bea, I don’t like rice pudding at all, but this looks so pretty. Kawai. Great idea Béa. I enjoy having holiday dinners that are anything BUT traditional. I think they are more memorable. wonderful idea and amazing shot, i love your blog! Woman, you are genius. Lovely. I am a fan of your blog and off course your beautiful pictures. Superb! Riz au lait is perfect any time for any reason (but especially in stressful times!) and to pair it with fruit for sushi…Yum and so creative! this makes me so happy bea! What a novel and wonderful idea, Bea! I’ve never been a huge rice pudding fan but with fresh fruit and lemony flavor instead of raisins, this might just win me over! I cant wait to do them they seem sooo delicious! I think some thin ripe mango slices would be delicious, too. Thank you for getting my sushi juices flowing! What a fabulous idea! You never cease to amaze me! I had something similar at a restaurant for brunch once–Frushi, they called it–here in Chicago, and have been scratching my head trying to figure out how to replicate the idea at home. Thanks for the clever recipe! Very refreshing idea to rice pudding.. and simple to make! 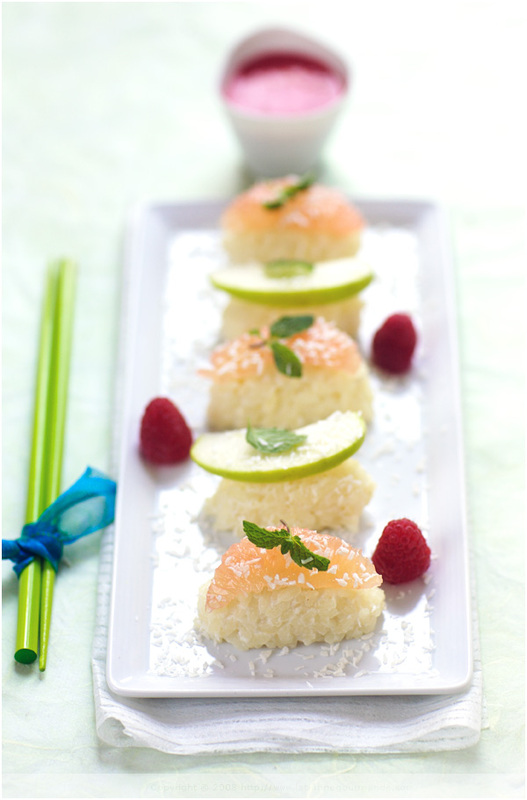 I love this concept – making rice pudding into sushi for presentation sake. This is downright awesome! This is so creaative I love it! WOW! Gorgeous! They look delicious, light and refreshing and if you ask me… that is ok after a heavy meal like Thanksgiving. Oh this is these are the sweetest little things!!! I’m in love with them! pretty and healthy.. what a beautiful idea. Well, the thing is that I always rinse the rice when I make rice pudding, and since I started this way. And so that you know, the rice stays sticky! Nessie, thanks for your suggestion. I really want to try that option now too! Beautiful presentation! I wish II could have this right now with a cup of coffee. what a brill idea! love it..awesome colour..
OK, so we were reading your blog this evening and came across this post–and 12 cookbooks and countless articles later, we both looked at this and said, “Brilliant! How come we didn’t think of this.” OK, enough narcissism. What a concept. We’re thinking of dumping our Thanksgiving tradition of squash/candied ginger pie and making this instead. Utterly gorgeous. Quelle bonne idée pour un petit dessert élégant et relativement simple! I tried this recipe and LOVED it! I blogged about it today and linked to you. Such a novel idea, love the blog and will be trying some recipes out and will refer back to you. Now that’s my kind of sushi! Love this idea. a doubt – when you heat milk with lemon juice, it curdles. Is this pudding made with curdled milk? It doesn’t because I am only using the zest and extract.